Hidden within a three-storied office building in the Dallas suburb of Plano, Texas is the AT&T Foundry, a startup lab brimming with prototypes and equipment. Also in the AT&T Foundry is a replica of a semi-truck cab complete with a high-resolution, video-game display, pedals, speakers and authentic-looking dashboard controls that helped an AT&T customer develop a tracking system. 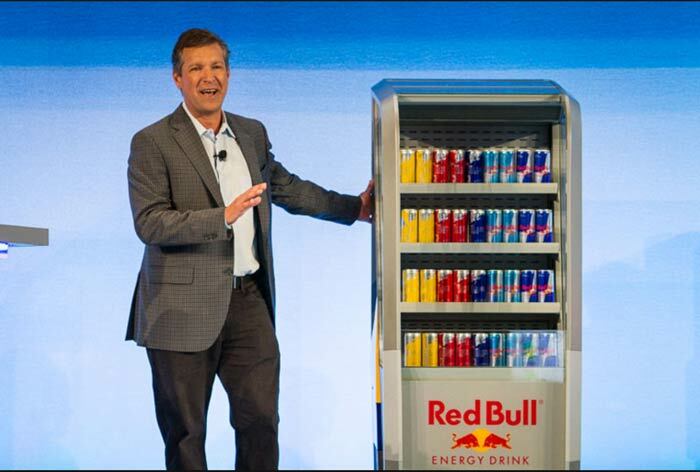 The Red Bull cooler displayed at the 2016 AT&T Summit. The reason AT&T created its network of foundries is to help its customers address a business need with an IoT product as quickly as possible. In addition to the one in Plano, there are three locations in the United States, one in Mexico and another in Israel. The company’s extensive experience working with connected devices (the Plano AT&T Foundry was founded in early 2011) helps customers avoid “going down dead ends,” Lee said. The foundry’s upstair collection of production equipment can also accelerate prototyping. For instance, instead of sending out a circuit board design to a manufacturer and waiting weeks to receive the board, the Plano AT&T Foundry can produce PCBs in-house in minutes. A precise pick-and-place machine can help assemble minute components. In the back is a water jet cutter that can slice through pieces of steel as much as 10 inches thick. In addition, 3-D printers are on hand to make custom housings and other plastic parts. The center can also make limited runs of injection-molded parts and has tooling for woodworking. The latter came in handy for a client who wanted to incorporate trackers into two-by-fours attached to shipping pallets. One example that highlight the Foundry’s pragmatic problem-solving approach is a portable toilet prototype. One of AT&T’s customers, a construction company conglomerate, was battling worker attrition. The customer surveyed workers to understand what their complaints were. The first was related to the lack of clean portable toilets while the second was access to cold bottled water. An LTE-M battery powered sensor in the unit measures how quickly the door is open. That measurement is then beamed to the cloud for analysis. If the door is slammed shut, it provides a useful signal that the unit needs cleaning. “We will see the door open and closed without a person going in. That signature shows that something is wrong,” Lee said. Extra sensors on the unit measure tilt and can detect if it has been tipped over. “The minute this happens, it sends out an alert,” Lee explained. “A GPS sensor helps cleaning staff locate units that need servicing,” Lee said.